Leena Pendharkar's film follows a couple faced with some tough decisions after their 20 week scan. 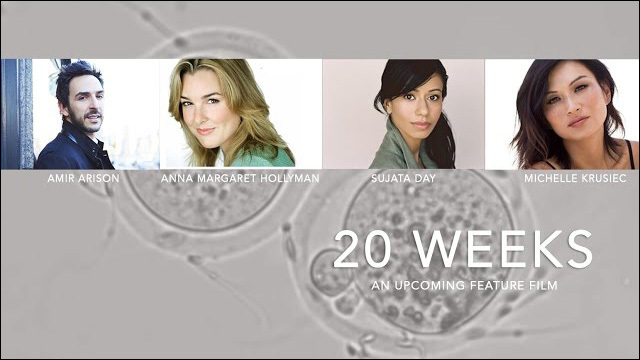 Here's an upcoming indie feature film project that would use your crowdfunding support... 20 Weeks is a romantic drama about love, science and how prenatal and genetic testing impact every day people. Based on writer/director Leena Pendharkar's own experiences, the film centers on a couple who must decide on how to move forward when their baby is diagnosed with a serious health condition in utero. The cast includes Anna Margaret Hollyman, Amir Arison, Sujata Day and Michelle Krusiec. Leena says she was inspired to tell this story after experiencing complications while she was pregnant with her second daughter, who was born with a serious but treatable health condition called Pierre Robin Sequence. Like the couple in the film, she and her husband grappled with some very difficult decisions. "Sitting in the room, looking at a sonogram, the doctors ask you to make decisions that are tough, that have you question what's right or wrong, and for which you need to go on faith to move forward," Leena shares. "It was this experience that inspired me to tell this story." The goal is to raise $50,000, which will go towards all stages of the film's production. To learn more about 20 Weeks, and to contribute to the project, head over to Indiegogo.